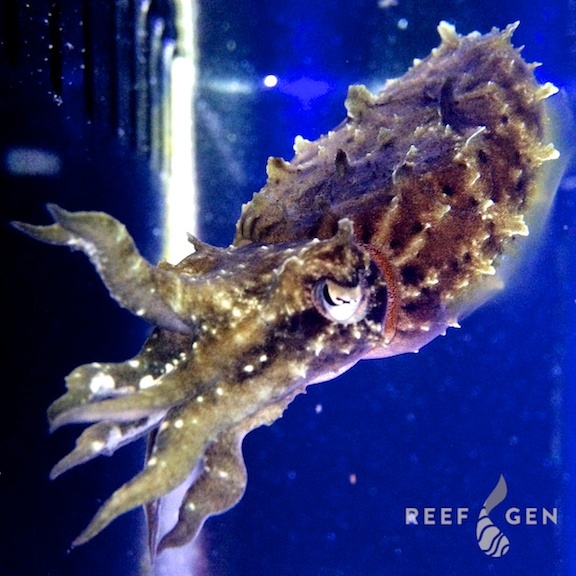 After many long years of finessing her technique, Laura is thrilled to present captive bred dwarf cuttlefish (Sepia bandensis) now available through ReefGen! Captive bred cuttles are hard to come by, as newborns are extremely difficult to raise to adulthood due to the demanding nutritional needs of the babies. Why do we do it then? Because these astounding creatures make absolutely AMAZING pets. They rapidly change their skin’s texture and color to reflect their mood and to camouflage with their surroundings. These cuttles are among the most interactive cephalopods, readily accepting hand feeding! Our bandensis are extremely hardy and adaptable at this age, although species-only tanks are recommended. They do not escape open top tanks and live well with most coral. They readily take saltwater grass shrimp at any size, and we are proud to offer this live food source for sale as well.